Situated in the heart of the Masai Mara, andBeyond’s luxury Kichwa Tembo Tented Camp provides guests with luxurious accommodation and world-class service. Tents are elegant and timeless, achieving the perfect blend of simple contemporary and authentic African style. Enjoy views of the spectacular Mara and get up close with the resident warthogs near the pool. With everything from luxurious tents, 5 star meals, and twice daily game drives; what really makes Kichwa Tembo so special, is the staff. This camp is renowned for its welcoming team of Kenyan staff whose impeccable charm and effortless energy warms the hearts and leaves a lasting impression on guests from all over the world. Built in and around the dense riverine forest on the border of the Masai Mara Conservancy; Great Plains Conservation’s Mara Plains Camp offers superior luxury accommodation with a dedication to conservation and sustainability. No cement was used in the construction of this camp. This is to ensure there is no impact on the natural environment, leaving no trace behind. 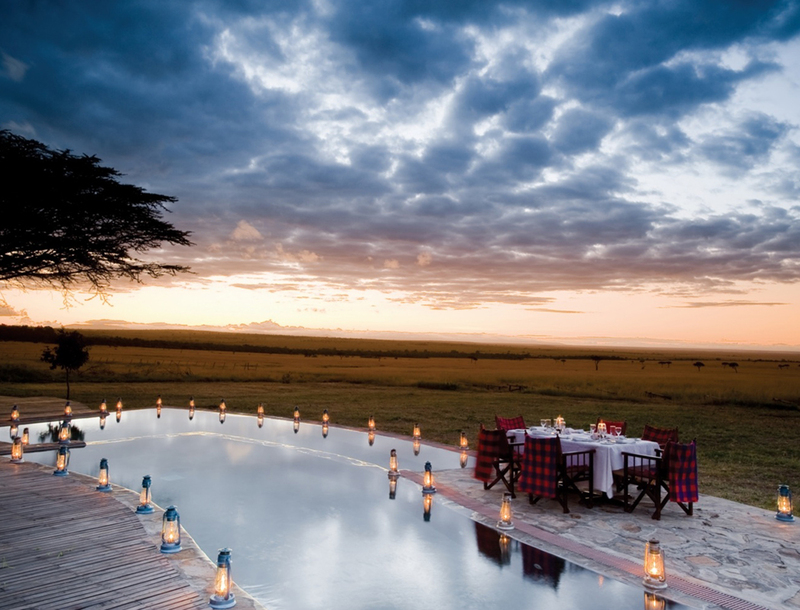 Along with being sustainable, another reason we love Mara Plains so much is its intimate setting. Accommodating no more than 14 guests at a time, you’ll feel like part of the family when you stay at Mara Plains. One of our favourite camps in Tanzania, Serengeti Under Canvas offers everything you could possibly want in a luxury camping experience. Here you will find chandeliers and silverware, beautifully comfortable beds and en suite flush bathrooms. All perfectly complemented by private butler service. Only the canvas of your tent separates you from the Serengeti, you truly are one with the wild at this camp. One of many reasons why we love this camp so much is that its semi permanent and moves according to the Great Migration bringing guests within close range of the massive herds of plains game. andBeyond use only private campsites for their mobile camps creating an entirely intimate as well as exclusive experience, featuring just nine spacious safari tents including one family tent. Finally, one of the many highlights is night-time as millions of stars light up the Serengeti Sky. DumaTau means “roar of the lion” . This beautiful luxury tented camp is located in the private Linyanti Wildlife Reserve. You can expect to see large herds of elephants and brilliant game viewing along the Savute Channel. What makes this camp extra special is the activities on offer. Unlike many camps that offer only game drives; DumaTau offers, walking safaris as well as boat rides on the Linyanti. Traverse the wilderness with a spotlight in search for nocturnal animals during after dark game drives. In addition to these activities, another highlight of DumaTau is the “star bed”; offering guests a luxurious experience sleeping under the stars with prime viewing of the gorgeous Zibadianja Lagoon. The effortlessly elegant Singita Lebombo encompasses modern refined luxury with contemporary earth tones. You can expect an organically simple yet deluxe atmosphere throughout its thirteen luxury suites and private villa. Situated within the Kruger National Park, Singita Lebombo offers more than luxury appointed accommodation. Other features of the lodge include a multi-level retreat featuring a library, multi-media room, wine studio and rooftop viewing area. There is an interactive kitchen as well as a 25-metre lap pool. The activities on offer at Singita Lebombo are only heightened by its exceptional location within the Singita concession. Well known for the impressive concentration of the ‘Big 5’ and four particularly formidable prides of lions. Enjoy daily game drives with professional guides and trackers. These drives provide the opportunity to get up close to Africa’s incredible wildlife. Discover the magic of nocturnal Africa during the evening game drives.